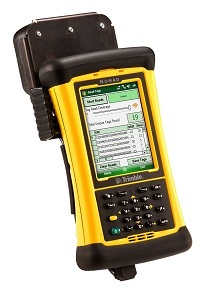 Trimble introduced a new version of the AllTrak Asset and Tool Management System that includes an RFID scanner for its Nomad outdoor rugged handheld computer, designed to increase contractor productivity for tracking tools and other job site assets. Contractors can perform a variety of functions using the Trimble Nomad with the new RFID scanner, such as asset check-in, check-out, transfers and inventory validation. With an effective range of 3 to 4 feet, RFID technology does not require line of sight for the tag to be read, making it an ideal technology for quickly reading the tags of multiple assets that are in a pickup, service truck or tool crib. With portable RFID capabilities, the AllTrak System allows building construction contractors to increase performance by improving asset utilization and monitoring equipment to avoid losses. Users can also attach the ThingMagic USB RFID Reader to a desktop or laptop when a portable solution is not required. Utilizing the RFID tag protocols “UHF EPC Gen2” or “ISO18000-6C”, the Trimble AllTrak System is specifically designed for general contractors, as well as concrete, steel, mechanical, electrical, plumbing and site prep subcontractors who use tools with embedded or attached RFID tags that support these protocols. Trimble AllTrak distributors can also provide RFID tags that can be attached to assets.